...At a mere 17 inches, the miniature brown mare known as Thumbelina takes pride in the lofty title of the World's Smallest Living Horse. Her companion, Radar, is a Belgian draught horse with his own big claim to fame - as the World's Tallest Living Horse. ...At their get-together, the two didn't exactly see eye to eye. But with 62 inches between them, there was plenty of catching up to do. 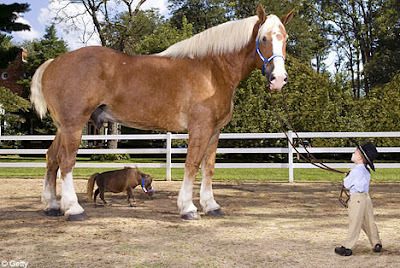 It was the first time the world's smallest and tallest horses had been photographed together. Their portrait will be featured in the 2008 edition of the Guinness World Records book, which is published next week. Thumbelina, who weighs 4st 9lb, was born on a farm in St Louis, Missouri. Her owners breed miniature horses but Thumbelina is a further quirk of nature - a miniature of a miniature. She eats two cups of grain and a handful of hay each day. Radar, at 6ft 71/2in from hoof to shoulder, is from Mount Pleasant, Texas. At 2,400lb, he has a giant appetite to match, putting away 20 gallons of water a day and 18lb of grain. Thumbelina is so badly malformed that she cannot even lift her head. I wish they would not parade her around as an example of a miniature horse. There are a great many very beautiful miniature horses who are healthy and well-proportioned. See Einstein: http://www.dailymail.co.uk/news/article-1369859/Einstein-worlds-smallest-horse-gets-set-birthday.html - now he's a good example of a lovely miniature horse - and very tiny too!